Size: 6.4" x 3.2" x 1.5"
Introduced together with the TI-58 these calculators introduced a novelty, the Solid State Software Modules™ with up to 5000 program steps. On the backside of the TI-58/59 you'll notice a small lid with a place for a module. The Master Library with 25 different programs was included, a lot of other modules were available. Don't miss the even greater program collection for the TI-59 resulting from the Professional Program Exchange (PPX-59) initiative started in November 1977. It took just a few month before Reynolds and Reynolds, headquartered in Dayton , Ohio , introduced in October 1977 with the COMPEG 2001 payroll computing system the first application programmed in a customized Solid State Software Module™. Various application specific modules were developed for the TI-58 and TI-59, based on the "ROM-Code" numbers found in some of the modules we estimate more than 50 different designs. Don't miss the rare and innovative Franken-Calculator Data Dimensioner. Compared with the SR-52 the memory space was raised by a factor of four, sporting up to 100 memories or 960 program steps. A new flexible approach allowed the conversion of 1 memory to 8 program steps, base configuration was 60 memories and 480 program steps. Read more about your first steps of programming this calculator here. A similar calculator was sold with the huge desktop-model SR-60A. Don't miss the odd TI-5230. The TI-59 Programmable calculator marked the end of a calculator evolution started with the SR-50 three years ago. The SR-50 defined already a calculator architecture using an Arithmetic chip (TMC0501) with up to 8 additional Scanning Read Only Memories of 1k*13 words each. The programmable calculators added RAM circuits, a card reader and printer interface and even an external program module. Fellow collector Sipke de Wal († May 13, 2004) created a block diagram of the TI-59 calculator and a very detailed diagram of the TMC0501 centered architecture. The TI-59 uses a card reader for magnetic strips, unfortunately they were neither compatible to the SR-52 nor was the drive reliable. Fellow calculator collector Marek Czeszek prepared wonderful Step-by Step Instructions how to clean a TI-59 and repair the card reader. Interested in other calculators with a magnetic card reader? Don't miss the Casio PRO fx-1. Both TI-58 and TI-59 sport the connector to the printing cradle, these calculators work on the PC-100A, PC-100B and PC-100C revision. American Micro Products introduced with the Module Selector a very interesting product fitting into the charging bay of the printing cradles. The calculator was available till the year 1983. Don't miss the TI-1750 introduced only few weeks before the TI-59, the first LCD-calculator sold by Texas Instruments. The TI-59 was mentioned in TI's press release dated August 15, 2002 to celebrate the 35th anniversary of its invention of the electronic calculator. Andreas Gerlich scanned recently the German documentation of the TI-59, please visit his website. Thanks! If you don't own a TI-58/59 calculator - emulate it ! 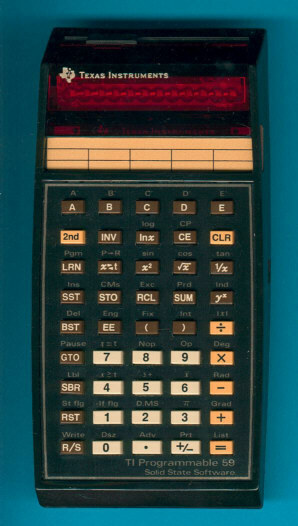 The TI-59 is featured in the Texas Instruments Incorporated bulletins CB-276, CL-283 and CL-276A dated 1977 resp. 1979. Magnetic card programmable calculator with plug in Solid State Software* and magnetic card storage for business, science, engineering. Up to 960 program steps, or up to 100 memories. When integrated with any of the libraries it delivers up to 5000 program steps. Master Library module simply plugs in. Includes 25 different programs in key areas: Math. Statistics. Finance. Blank magnetic cards let you write and record custom programs which may be run individually or integrated with programs in the library modules. 4 types of display testing with an independent test or "t" register. Up to 10 additional test registers: Loop. Increment. Decrement. Up to 10 user flags available: Set. Reset. Test. Up to 6 levels of subroutines. Flexible addressing: Program Steps: Absolute. Indirect. Label. Data Memories: Direct. Indirect. Complete program editing: Insert. Delete. Single step. Back-step. No Operation. 10 user defined label keys. Up to 9 sets of parentheses for up to 8 pending operations. Over 175 functions and operations in sciences and statistics. Personal Programming takes you through each function, each operation – step by step. With illustrated examples that will be highly adaptable to work you do: Bond cost. Spherical coordinates. Investments. Quadratic equations.